That is a funny twist... HCE had a full line of cats, but were anemic in sales. Makes the customers (some of them) happy.We have an "anemic" quiver of cats that sell. Makes the company happy. Guess which is more important to Hobie. Guess how you stay in business. Guess why Hobie isn't going to move too fast here. On another note, how about filling in the location field of your profile? I'd like to at least know if my overture towards camaraderie is geographically feasible. Last edited by MVD on Wed Nov 21, 2012 10:19 pm, edited 1 time in total. Note that the dates MVD listed are wrong (based on a preliminary NOR which seems to have made the rounds). The actual dates are April 11-14 (the link goes to the "real" NOR). How big do you think the catamaran market is in North America? I'll give you a hint - it's way smaller than you think. This may be true for F16, F18 and alike elite racing cats, but past popularity of H16 is a proof for a significant market potentials. IMO, new One Design racing must follow from popularity of the boat, not the other way around. Just like H16. I don't see HCC developing another F16. It is just too complex, expensive, and fragile to be appealing to a broad audience of sailors. A new boat needs to have H16 attributes -- simple and inexpensive performer, but with a modern design. Even Perl could be too complex to be true popular. Perhaps something in the line of Tatoo, but with bigger sail and glassified? This is no different from other sports. If you want to compete at world class in cycling, you need a $10,000 bike. Guess how big is the market for $10,000 bicycles -- it's way smaller than you think. But there is a significant demand for nice performer at $3000. Any yes they are often made of carbon, and I do own one. A 40-your old bike design would have no chance. Back, to the issue of the boat price. I was not there at the time, but can anyone confirm, how much was a H16 in 1970's and 80's. Was the low ticket price a major factor in popularity of H16 at the time? Mr. Bounds is correct regarding Mid Winters dates. I edited my previous posts accordingly. Just trying to stay on the on the same page. Revised dates are April 11-14. Last edited by MVD on Wed Nov 21, 2012 10:42 pm, edited 1 time in total. Back, to the issue of the boat price. I was not there at the time, but can anyone confirm, how much was a H16 in 1970's and 80's. I bought a brand new H16 with a new trailer in 1977 for $2100. It was in December, so the dealer in Western Kentucky was motivated to shave a few bucks off the price to unload some inventory. This guy sold Hobies and a few other sail and power boats out of a Phillips 66 station near Kentucky Dam. He had virtually no overhead, so his price was probably below average even for that time. I bought a brand new H18 with a new trailer in 1984 from Rooke Sails in Memphis for $4000. 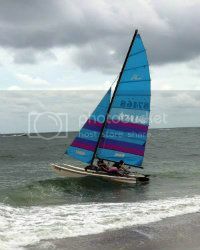 In my opinion, price isn't our problem, nor is it necessarily the design of the Hobie 16. I believe that the big issue is that potential sailors are bombarded with a plethora of other options, certainly more so than in the 70's, that compete for scarce time and resources. The typical American family is much busier than they used to be, so they want instant fun: video games and personal watercraft, for example. Keep in mind that it's not just the Hobie 16 that's declined in popularity, but sailing in general as seen it's numbers greatly decline since the sport's glory days in the early 80's. MVD's 1977 H16 with trailer for $2100 can be compared to a 1976 Toyota Celica for $4500. Price for a new H16 now is roughly the same ratio to a new car, or maybe a bit lower. I don't think Hobie has ever had a reputation for discount or low pricing, nor has sailing. That's why people who were cheap built their own boats. Converting your purchases to today's dollars, your brand new 1977 H16 and trailer equates to $8,015. Your new 1984 H18 and trailer equates to $8,905. Those were very good deals! I doubt we'll see Hobie Cat going the "Skunk Works" route and pouring additional monies into the largely unprofitable "high tech" manufacturers arms race only to see their expensive development projects become uncompetitive in 10 years time (see: e.g., Tiger, Wildcat). If it was up to me I'd love to see something similar to Bimare's X2 F18HT simply because I love the design and performance, but who besides me would ever consider buying it?? Answer: Nobody. My guess is Hobie will eventually introduce one, at most two, additional models (hopefully of the fiberglass variety), and these will be marketed to the weekend warrior/recreational racer-types who make up the bulk of their customer base. Of the HCE models I really like the Pearl but I can see the bean counters nixing that idea, arguing they already have that "segment" covered with the Getaway. The Hobie Max looks nice. I doubt we'll see Hobie Cat going the "Skunk Works" route and pouring additional monies into the largely unprofitable "high tech" manufacturers arms race only to see their expensive development projects become uncompetitive in 10 years time (see: e.g., Tiger, Wildcat). Yes I agree, unless Hobie wants to be relevant in the high end market which could be likely. WIldcat is visible in the F18 market which in it self promotes name recognition. I am not sure where F18 market will go but the fancy pants racers will go somewhere and Hobie should be there IMHO. A new boat needs to have H16 attributes -- simple and inexpensive performer, but with a modern design. Even Perl could be too complex to be true popular. Perhaps something in the line of Tatoo, but with bigger sail and glassified? Was the Hobie 20 successful for Hobie? 730 or so boats produced. ......and this is where I believe this forum is relevant. The market I see is somewhere between the H16 and the H20. Can Hobie introduce a boat like the Pearl and develop racing rules around the 3 sail rig and make it marketable to the broad market? 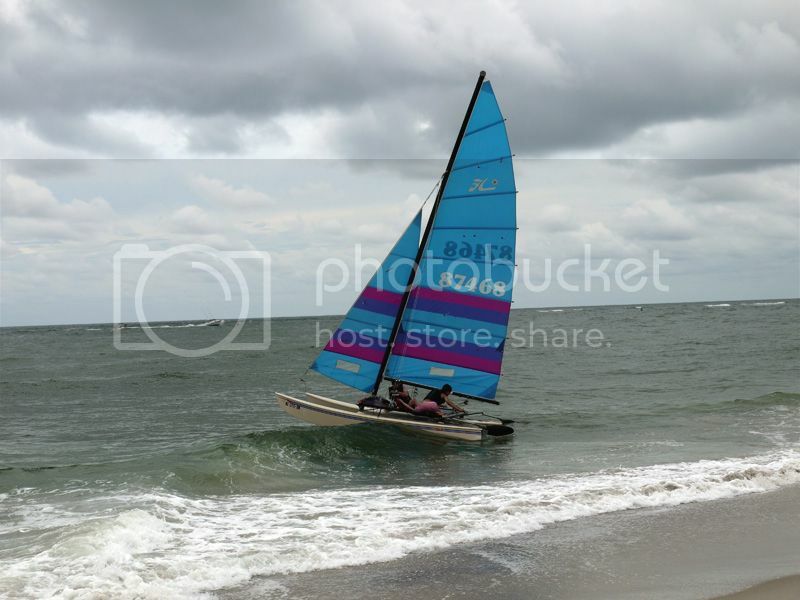 One set of rules for racing are absolute so the third sail is in or out. period! Can the third sail be an option on the boat if that makes it class legal to race? Does the third sail make the boat unapproachable to new(er) sailors? I still believe the current Fleets would support such a boat and need one for growth opportunity. Keep in mind that it's not just the Hobie 16 that's declined in popularity, but sailing in general as seen it's numbers greatly decline since the sport's glory days in the early 80's. This is crux of the issue IMHO. Sailing in general has become less popular and I think it's because it's perceived as being a non "accessible" sport and it doesn't have a "cool" image to most people. If Hobie can take an active role in promoting sailing through social media, taking full advantage of Facebook and Youtube, especially now that the Americas Cup is working very hard to become part of public consciousness, they should be able to reignite 'cat fever'. 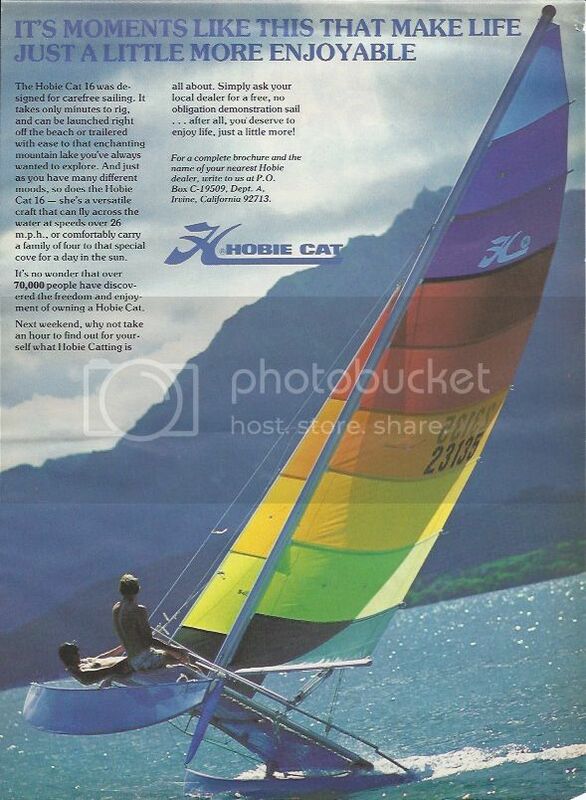 Until there is a wider appeal, you can see why Hobie isn't rushing to develop the next generation of cat. I think everything has a cyclical nature, and maybe it's coming around again. People in general are getting back into healthy outdoor lifestyles. People are thinking more green. Hobie just needs to tap into it and come up with some clever focused marketing and get back to promoting 'the Hobie way of life', Have a Hobie day', 'Share the wind' culture. I have this photo taped inside my closet door so I see it every day to remind me of what I can look forward to on the weekends... Maybe this is more of what Hobie needs? I agree the above,more exposure,awesome classic snap!. Last edited by aussiebob on Sat Nov 24, 2012 8:46 pm, edited 1 time in total. Hey ftlauderdale16, great image... what vintage ad is that? Hey John... I don't know the exact date, but I believe it's the 70's sometime. Probably later 70's. I'm not sure I agree that a family of 4 can have a comfortable day of sailing on an h16... 2 adults is crowded on mine.